You are invited to join the Collinsville Chamber of Commerce. 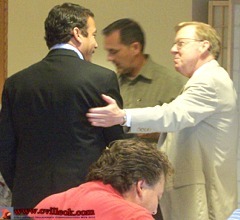 Oklahoma District 11 Representaive Earl Sears addressed the Collinsville Chamber of Commerce June 5, 2008. The Collinsville Chamber's June luncheon meeting was well attended by local elected officials with Collinsville Mayor Stan Sallee, State Senator Randy Brogdon, State Representative Earl Sears and Rogers County Commission Mike Helm in this photo. Tulsa County Commissioner John Smaligo (and several other Tulsa County officials) were also in attendance along with local merchants and citizens interested in Collinsville's future. Having just completed his 2nd legislative session in the Oklahoma House of Representatives, Earl Sears was excited to announce he was unopposed for another two year term with the filing period closing June 4th. Oklahoma's $7.1 billion budget (down $114 million from last year) drove most of the recent session in OKC. Sears described it as a "standstill" budget with "no cuts, but also no increases" as every area of state government faces increased expenses. Huge increases in gas prices are obvious to everyone, but the price of asphalt has doubled in the past year at at time when road and bridge improvements have become a high priority. "Oklahoma has faired well" relative to most of the entire nation which is facing an economic downturn. HB 1739 passed which may change competition between municipal electrical providers (like Collinsville) and outside providers without franchise election requirements. State budget shortage is primarily due to corporate taxes being down. Most revenue from oil increases already directly targeted to specific accounts (outside the budget). Education is one of about six such accounts. Capping state matches for donations to higher education with huge increases at OSU/OU (thanks to Boone Pickens and David Boron's efforts among others). Matching legislation was set when donations were much smaller. "Honored to be your state representative" ... enjoys your visits to the capitol and question. Commissioner John Smaligo: Wants state to open "rainy day" fund to help with funding short falls caused by December 2007 ice storm (for the state's 12-1/2% portion to local entities). Commissioner Mike Helm: Concerned with state finances with state auditor under indictment. 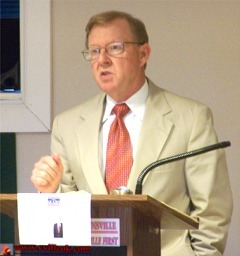 Mayor Stan Sallee: Has been told by Congressman John Sullivan that federal funds for ice storm had been sent to state. Asked for help getting the local portion of that expedited. Rep. Earl Sears: said that one thing he has learned in his short time in state government is that "nothing happens in a hurry".